A quick note to all those with an active overactive imagination, never watch a scary movie when you're home alone, especially when it's late at night. Case and point; Paranormal Activity 2. I knew it would be oafish to watch that particular movie alone, at 11 pm, whilst house sitting. But besides a hyperactive imagination, I'm also delightfully impatient and perhaps masochistic. As I slid the harmless dvd into the non-threatening dvd player, I wondered why 'we do this to ourselves?' What compels us to watch movies that we know, well ahead of time, will to freak us out? Even though Paranormal Activity 2 didn't require the futile method of "watching through basket-woven fingers" technique, it did leave me jumpy for the rest of the night/morning. Luckily these churros, along with an acerbic episode of House, smoothed things right out. Churros are basically crunchy, fried pastries rolled in sugar. And they're as simple to make as they sound. For something that's so easy to put together, the taste is spectacular...but what isn't spectacular when there is frying involved? 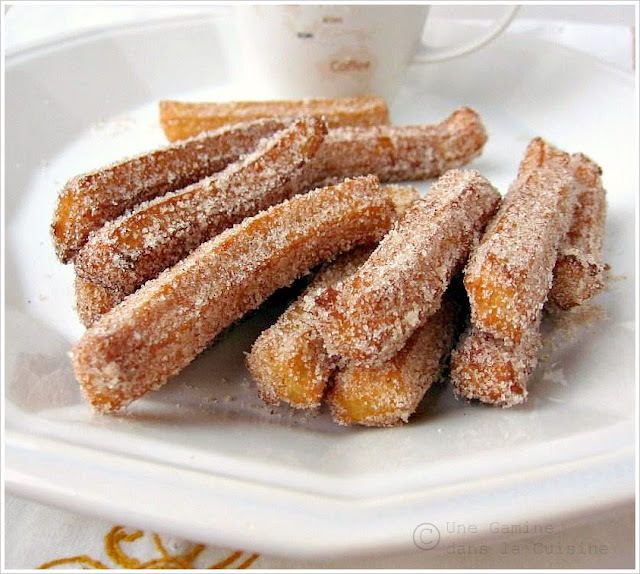 Because the batter for each churro is squeezed through a star-shaped pastry tip, they develop lovely ridges that become magnets for the oil, which in turn clings deliciously to the cinnamon sugar mixture. So you're left with a delicate, crunchy, straw-like pastry with a sweet cinnamon coating (which offers even more crunch!). You don't truly need to dip these in chocolate to enjoy them, but I won't lie; when dipped in chocolate elixir, they're even more irresistible. What's also great about churros is, unlike most fried desserts, they're just as good cold as they are straight from the frying pan. Plus they're the perfect snack to help you calm down after a night of scary movie-induced jitters. Place the sugar and cinnamon (coating ingredients) into a large, shallow bowl. Whisk to combine. Set aside. In a small saucepan over medium heat, combine water, the 3 Tablespoons of sugar, salt and the 2 tablespoons vegetable oil. Bring just to a boil and remove from heat. Stir in flour until mixture forms a ball. Heat oil for frying in deep-fryer or deep skillet to 375F. Transfer the thick batter into the pastry bag. Fry until golden and transfer to paper towels to drain. 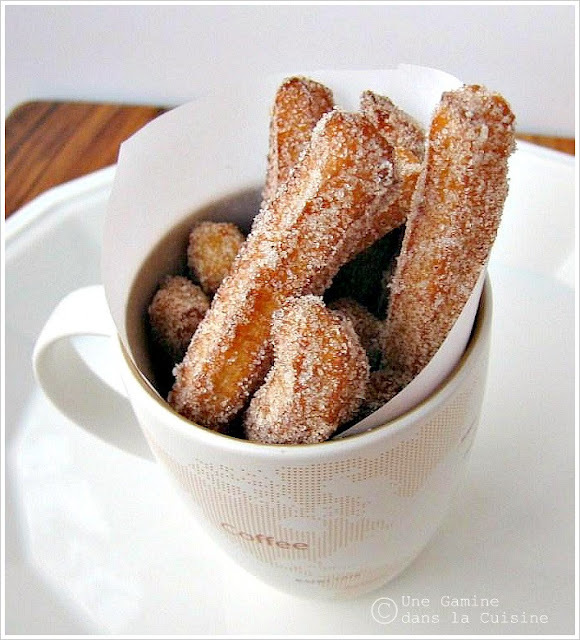 Roll the drained churros in cinnamon and sugar mixture. Depending on how long you make the churros, this will make about 20-25. Those churros are perfect! A heavenly treat. Che buoni Valerie ! They must be so perfect with the chocolate ! I might make them tomorrow for my kids ... no scary movie necessary ! Your churros look sublime. And I'm glad they helped you through Paranormal Activity! I would never have the nerve to watch a movie like that, but I wouldn't say no to the churros. 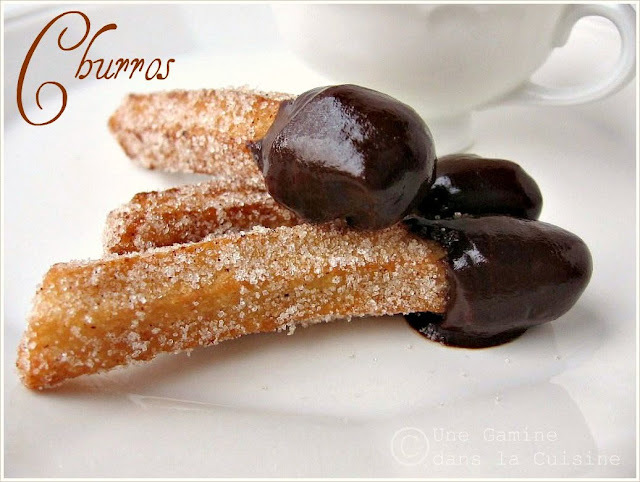 That picture of the churros dipped in chocolate made my mouth water. Yum! Excellent work, as always! i've tried your recipe, along with many others. But one problem i keep facing is that the inside of my churros is wet. do you know why this is so, and how to prevent this? Maybe the churros are not fried long enough? The first few that I made were a bit 'doughy' because the oil wasn't hot enought, and I pulled them out too soon. Ah...Churros the great Spanish version of a fried donut!! Yum!! These churros look simply divine. My sister likes to put Sewing with Nancy on after a scary movie to wipe away the memories. In any event, homemade churros are on my cooking to-do list. These look awesome. I love churros, Valerie. These look gorgeous. I do the same things with movies, watch them when I know I'm gonna be freaked out for the rest of the day. I haven't been able to bring myself to watch Paranormal Activity though! I just tasted the churros my mom made and it was like heaven on earth! @norcallindz, I bet they're even better on the thin side (more crisp and "fried!") Happy to hear that they were a success! !